Marcia Q. Miller and her daughter Callie are partners in art and business, working metals into jewelry. Soldering red brass, copper and silver wire onto sheet pewter, symbols are etched onto the surface, shapes finished and polished. Stones and glass embellish with color. Marcia's inspiration are imagery of primitive culture. 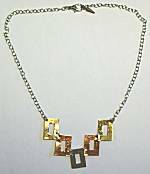 She started her jewelry business in Bozeman, Montana in the 1980's, her daughter joined in 2002. 2-5/8 inches long including sterling earwire, 1 inch across. The asymmetrical interest of inveting the curves, works well in balanced style. Polished pewter curve with stamped circle pattern, brass wire folds on it, PINEAPPLE QUARTZ stones dangle below. 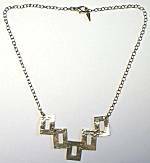 Center pendant is 2-7/8 inches long, 1-3/4 inches across, suspended from silver chain with lobster clasp, 19 inches (or clasp it on links for shorter). Polished pewter bar with circles stamped in it, is soldered to brass wire curve with free moving brass nuggets at the top, a beaded bar holding that. PINEAPPLE QUARTZ stones dangle upon it. 2-3/8 inches long including sterling earwire, 1-1/8 inch across. Asymmetrically fashioned with the brass wire curve inverted. Soldered to polished pewter bar with stamped "x" pattern, another brass wire spiral suspends it from earwire, then PERIDOT and larger AMETHYST stone beads add color. 1-3/4 inches long including sterling earwire, 3/4 inch across. Polished pewter piece has embossed patterns around the AMETHYST cabochon, a seafoam CHALCEDONY dangles within the brass oval ring. 1-3/4 inches long including sterling earwire, 1-1/8 inch across, the polished pewter forms a cute owl shape, accented with soldered brass and embossed details, and fancy brass bead. So cute, mouse heads in polished pewter with brass ring ears, suspended on sterling wire with tiny stone bead accent. 1 inch across, 1-1/8 inches long including sterling earwire. A pair of sheep, or a pair of lambs, these delightful earrings are polished pewter with brass highlights, etched details, swinging from sterling earwires with stone accent (stones vary). 1-1/2 inches long, 1 inch across. 2 x 1-1/2 inch pin is polished pewter soldered with brass highlights, etched impressions combine to reveal the sheep in this pin. Horizontal barpin clasp. Thin hammered polished pewter rectangles are 3/4 inch tall, joined together they span 3-1/2 inches of front. 16 inches long with lobster clasp. Thin hammered metal rectangles are 3/4 inch tall, joined together they span 3-1/2 inches of front. There is polished pewter at the center, copper and brass. 16 inches long with lobster clasp. 1-3/8 to 1-5/8 inches, the ladybugs are oriented in different directions for left and right ear. Polished pewter bodies and brass appendages, mixed beads add a dash of color under sterling earwires. 1-1/2 x 1-1/4 inch pin has polished pewter body, brass head and legs, depicting the lucky ladybug. Vertical barpin clasp. Graceful within the angles, polished pewter soldered together with brass wire, the wire has triangular spiral, the pewter has embossed symbols. Colored with heishi beads/shells. 1-7/8 inches long on sterling earwire, 1/2 inch across. Read about what others think of Q Miller jewelry! Instead of reviews for a specific product, this is a place to share about the designer line in general.